Events are hard work. You spend time a lot of time planning and preparing, as well as during the event making sure it’s a success. People often forget what really matters is what you’re doing post-event. Post-event follow up is key to ensuring your attendees’ experiences are stellar. 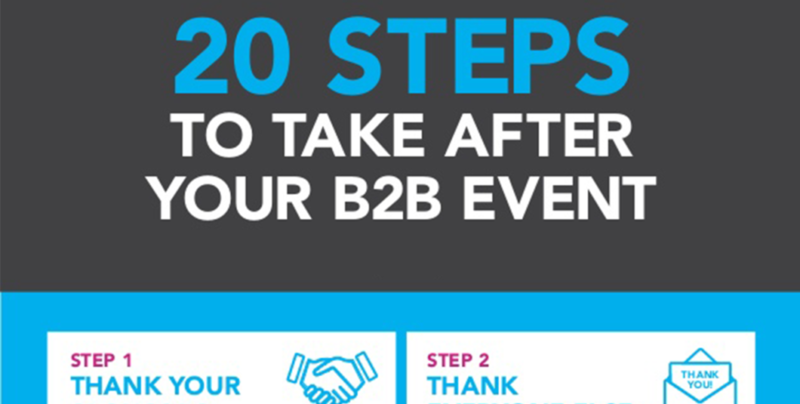 An infographic by agencyEA, an experiential and event marketing company, highlights 20 steps to take after your B2B event. Consider this: One study found that 87% of people who bought a product or service at an event also bought a product or service at a later date. How can you take advantage of that behavior? The infographic suggests that after you’ve thanked your attendees and sponsors, be sure to continue to keep them engaged with related online events and other follow-up content.